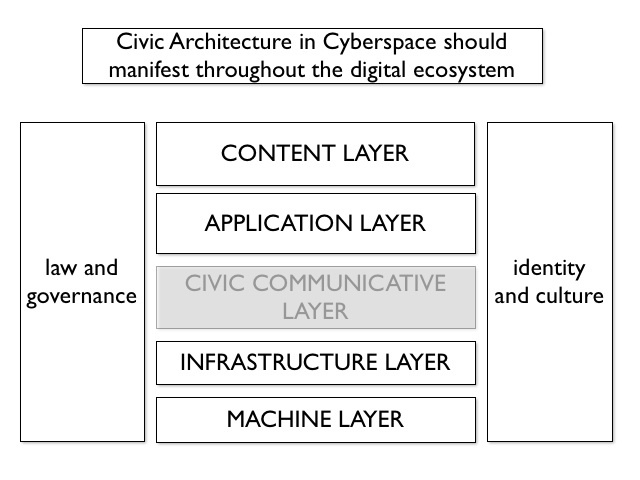 My thesis is (currently but persistently) titled “Civic Architecture in Cyberspace” and this post is an attempt to explain what I mean by this. Be warned that this also a draft for a section in the final document so may be a little slow…. When William Mitchell described his ‘City of Bits‘ in 1996 he recreated the physical city with retail, educational civic and commercial elements. He was in many ways talking against the zeitgeist at the time as the focus was on the potential of new technologies to break down barrier of time and place and create virtual communities as described by Howard Rheingold (Homesteading the Virtual Frontier, 1994). However now, as we see internet use near pervasive and mobile devices offering the potential for an augmented reality with real time, real place information it may be time to reconsider how we want to build our City of Bits. If market forces are taking care of retail and commerce and the education system is taking care of itself – who is building civic space online? An open physical layer should be built through the introduction of open wireless networks, or a spectrum commons. An open logical layer should be facilitated through a systematic policy preference for open over close protocols and standards, and support for free software platforms that no person or firm can unilaterally control. An open content layer. Not all content must be open, but intellectual property rights have gone wildly out of control in the past decade, expanding in scope and force like never before. There is a pressing need to roll back some of the rules that are intended to support the twentieth century business models. resist widely distributed production systems. To create such a commons we would need to align legal, technical and governmental structures as well as market forces and corporations who are currently very happy to be have the freedom to create walled gardens in the way many of us criticised AOL and others for doing when people first started going online domestically. There is in my view another layer that needs to be considered – perhaps best described as social and cultural. Boyd’s description of networked publics and the way in which people use web 2.0 spaces makes clear the importance of the audience in forming the nature and behaviour of the space and Donath’s work on social signalling online further extends this. Online the participants have a far more active role to play in the creation of the space than is possible offline. The networked publics that Boyd describes, places like Facebook and Myspace, suffer from the structural flaws which Lessig and Benkler explore and as such I would challenge their ability to be truly and persistently civic. Stephen Coleman and Jay Bluhmer have suggested the need for a civic commons online – a mediated democratic space – and this has been echoed by Sunstein in his book Republic 2.0. In this conception of civic space online their is an agreed space for democratic debate which has been created for this purpose and is linked to the formal decision making process. So – what do I mean by civic architecture online? Our built environment now produces a vast amount of data and as individuals the content we created is increasingly geo-located as we create more of it from smartphones and similar devices. I would like to see more that being open and available as feedback to the people. My work examining hyperlocal social media sites shows huge numbers of people using these technologies with the purpose ‘I want to talk to my community’ but in many ways these individuals are talking blindly as the civic infrastructure which could knit these contributions together is not there – this absence is what I refer to as the ‘civic communicative layer’. There is not obvious gathering place of place online. Where the town hall, village hall, pub, churches or the commons all serve as focal points in the physical world there are as yet no online equivalent and also no infrastructure to bring these together. Coleman’s civic commons is one element of this but that is formal – we also need the informal spaces where communities meet. I agree with Benkler who proposed an open legal and structural layer and I also agree with the need for process and organisational reform to achieve this. I would like to see open standards around the transfer of civic data and I would like to encourage the creation of focal points for civic discourse which are not mediated by the state. This could be simple – imagine that on connecting to the internet in a new area you were asked if you wanted to know what was happening in the community. Imagine that as you walk down the street you are able to see examples of civic projects and active citizens rather than the advertising that would currently be the only thing to flood an open phone. How about a civic weighted search engine which prioritised content which is relevant to the social fabric and not to commercial interests? Evangelists are tedious and I would be the first to admit that I am an evangelist for the potential of the social web. But much of this is rooted in my experiences 15 years ago when I first discovered these technologies and where the balance between commercial and civic content was I believe very different and when the hacker/academic antecedents of the social web were stronger. We have diluted this culture and though I think change and adoption is good now is the time to temper this by returning to those more civic roots and demanding that if we are building a City of Bits we should make sure that it includes civic space as well as a really big shopping mall. In common again with Benkler and others I freely admit that this is a moral as much as a researched position for me. However I don’t think its uncommon. What needs to be considered is the depth of this issue – practitioners in many different disciplines feel the absence of civic space as is discussed above but without often without the technological and legal perspective and writers like Benkler and Lessig bring. To be concerned about democracy online also means to be concerned about the fabric of the internet – the technical and legal standards which protect the openness which is so essential I believe to democracy. There is of course an alternative position which is the optimism of a benign market which talks about collaborative consumption and crowdsourcing of solutions. If true then this is an exciting thought but I currently fear that this is a closed wolf in open sheeps clothing and that commercial organisations need to be compelled to behave with more open practice. Its possible that local market forces might achieve this but not I believe without some strucutural intervention. We can and should continue to focus content and civic activists and I believe we will continue to see citizens creating civic spaces online with their hyperlocal activity. I hope we will see politicians interacting with them there. However, without addressing the structural restrictions described above this activity is limited as is our freedom online. This post is partially a write up of the identity session I curated at #UKGovCamp and partially a framing piece to help take forwards our discussions about how we handle the question of identity within the We Live Here Project and Citizenscape development more generally. Huge thanks to everyone who participated in the session. The UKGovCamp covered a lot of ground and was fascinating for me – not the least because it challenged one of my working assumptions which had been that the closer we get to actual decision making the more likely it is that we need to know – authoritatively – who is participating. The discussion focused on a discussion of identity in the context of deliberative processes rather than more transactional processes such as voting or ePetitions and really looked at the importance of quality as a measure over quantity. I must note however that I am not making an attempt to define what ‘quality’ means in this context – that is for another day! Before we talk about democratic debate there are some practical considerations with respect to online debate or community of any kind that we need to surface. The first point is that identity nearly always improves the quality of the debate – you get more considered views when there is some kind of social capital or standing involved in how these views will be received and people undoubtedly behave differently when they are anonymous. At the same time this has to be balanced with the fact that registration / identity creation is a barrier to participation and so you may get fewer people involved. Put crudely it’s a quality vs quantity question. These are not ‘democratic’ findings but represent the experience of online community designers and practitioners over time – imagine how much harder this stuff might be when the content focus is democratic. Identity clearly matters however, given that most people who work around engagement and democracy are concerned about how little people do participate, we have to ask if we are we making things unnecessarily hard for ourselves by saying we need to know who people are. The immediate anxiety about not wanting to create barriers aside, when we consider democratic values rather than the practical problem of how to make it most likely that people will participate there is a need to distinguish between bystanders, stakeholders and citizens at some point because some decisions are made at the ballot box where authenticated identity is an intrinsic element of the experience. The question under debate is what that point is. The UKGC12 discussion explored whether or not we should be interested in the validity of the individual or the quality of the debate – which is more significant? These are not mutually exclusive objectives but as we are designing the user experience there is a need to understand their relative merits and importance. One of the points that emerged was the importance of making a distinction between a discussion and a deliberative discussion – the latter have greater requirement for understanding of identity that the former. I think it’s interesting to ponder as to how often people know which of these they are participating in. We discussed whether or not you could examine social and informational signals from content in order to create a level of confidence around the fact that you have the ‘right’ people in the discussion. The general consensus was that this was possible – if you participate in these kinds of discussions in physical meeting then you do develop a sense as to whether or not people are genuinely stakeholders and citizens. This becomes a very different set of skills online and this fact, combined with the fact that it easier to collect identity information online that in a physical meeting (who brings their gas bill to the village hall??) and the fact that the practical barriers to participation are lower (you don’t need a babysitter and can ‘attend’ from a great distance) means that we perhaps put higher priority and focus on digital identity management compared to the way in which we consider this in offline processes. One question that designers of these online spaces need to consider is the level of online social sophistication that we assume of our users. Appropriate behaviour for one group may be outlandish to others. Commercial platforms have the luxury of focusing on the early adopters which is not always open to civic platforms. In some ways deliberation works better offline than online – the sense of coming together to focus on a debate is easier to achieve in a physical space. Offline debates – formal and informal – are happening all the time even if they are not accessible to a wider audience. However, many people find the meeting setting intimidating and it’s a format which favours experience and confidence. Offline debates break down more barriers that just those of time and place. I think there is an additional consideration with respect to local democratic participation which is the fact that it is far more difficult to keep your online and offline personas separate when compared to participation at a national level – and this means that most people will be ‘known’ within the debate. The result of this might be that in the medium we term we do need to be more stringent about identity because not doing so would create a lot more distrust in the system with absence of identity being the exception and in no way a norm. Identity is more complex online, particularly when it collides with your offline existence. We deliberatively manage multiple, sometimes contradictory, personas and the social norms are shifting with respect to separation between our public and private selves. However with respect to debate this is not a question isolated to the individual. Where we are asking people to participate we also need to understand what the individual needs to know about other participants in order to be comfortable and able to participate. Discussion is a social experience not a transactional one and that means we need a degree of reciprocity and social sharing to support it. Online we perhaps need to think more actively about the architecture and experience we build in order to support ‘quality’ discussions. With respect to identity, we may not need to know who the person is but we probably do need to know that they really are a persona and also that they have a legitimate voice in the discussion. To a great extent this debate is happening around government – Google and Facebook are facing off with respect to becoming your primary online identity and so at present we are drifting towards using the dominant model by default rather than actually thinking about the specific needs of democratic discussion and connection. It’s the changing nature of participation and the potential for mass participation which means we need to be more robust about identity that we are in the offline world. In unpicking this subject it is clear that different actors have different needs with respect to identity. As an individual I need to have control over my identity, as a participant I need to feel confident that the other participants are authentic, as an officer I need to be confident that I am seeing an accurate evidence base, but as a politician actually all I need is to feel that my opinion is being usefully informed. Tom Steinburg nicely described identity with respect to three tiers of authentication; totally invalidated, slightly validated with claims, completely validated. At present we manage no more that the second tier within government (though interestingly there are South American projects which got 3rd tier authentication active in a democratic context). Officers have the concern about creating an evidence base and for some the debate about identity is actually about asking whether or not it is possible to create a robust set of observations that cannot be rejected by politicians. Officers who are more familiar with the social web might be more comfortable with the second tier of authentication however with respect to deliberation Government perhaps has a greater need for identity management than politicians do. The final analysis focused on the priority actually being the creation of the opportunity for good quality debate – not just a numbers focus of getting ‘more participation’. In doing this it was actually felt that information makes a bigger impact than identity – both in terms of legitimising an individual’s contribution but also with respect to the overall quality. Agility – there needs to be some kind of decision making process embedded and it needs to be fit for purpose in a networked world. The session at UKGC12 added some nuance to this in terms of the exact nature of identity and has made me reflect more seriously about the information we glean from social signalling online in these shared spaces. We are not trying to create social networks in the sense of Facebook – but we do want to create a social experience. Do we want to facilitate people contributing anonymously at any stage or do we always want to design for tier two with some level of confidence that we know who people are? We will take these questions forward and start to discuss them with participants over the next few weeks – no doubt I will have more to say about it then! So – it turns out that my inability to fix my research methods chapter had the effect of rendering me unable to write anything else – who can understand the workings of the human mind??? Chapter 4 now dispatched I am now trying to catch up on backlog (this includes 3 UKGC12 posts – oh how I rue the day I pitched so many…). Anyway. This post is jumping the queue because I have been doing a lot of mulling recently, for various reasons, about organisational culture – its an attempt to synthesise these thoughts and organise them a bit. The first thing that brought this on is that fact that Carl Haggerty is going to be joining Public-i 2 days per week to work as Product Manager for Citizenscape. Carl has written about this here so this is my turn….I’m delighted Carl is joining us for all kinds of different reasons. The first is the simple fact that Carl is great to work with – having worked with him on the Virtual Town Hall pilot, as a client at Devon County Council and also in various GovCamp sessions I know that he combines expertise and forward thinking with the ability to challenge your thinking in a really positive and constructive way. This ability to issue constructive challenge is going to be crucial to someone who is coming into a project – Citizenscape – which has been very a huge amount of work for a lot of people for the last couple of years. The product has developed hugely from the initial EU project and then Virtual Town Hall pilots and has now been deployed across our core Connect sites as well – but we still it can go a lot further. Its live, stable and useful but so much of the functionality is lying below the waterline – in the code, locked into the UX and in the admin functionality. We are hoping that a fresh pair of eyes – from someone who understands what we are trying to achieve with Citizenscape – will help push it forward. The second reason I am delighted to have Carl join is about the blurring of boundaries. The fact that we will be sharing him with Devon County Council makes this a fairly unusual arrangement but one which I think reflects the new ways in which public and private sectors need to be working together. I hope that we will learn a lot from working with Carl but I also hope he will learn from us. I am very grateful to Devon CC for being willing to support this kind of working and I hope that the institutional learning goes both ways as well. There is a lot of talk about the Public Sector needing to be more business-like, to behave more like the private sector, but we don’t often reflect on what this actually means. This kind of shared working is a way of exploring the cultural qualities that might flow in both directions. I am hoping that Carl will have a positive experience of working a small business which is able to be far more agile and innovative than a local authority just by dint of its size but that also needs to be constantly thinking about selling as an essential part of its lifecycle. There. I’ve said it. The ‘S’ word. Doesn’t it send a shiver down the spine? Dan Slee posted a very pithy piece which explained very clearly why the public sector is right to have a poor impression of the private sector sales process and, as someone running a company, made me cringe. However I believe its possible – and perhaps even advantageous – to build innovative and useful projects that are sold and then co-created between public and private sector organisations. I also think that discussing value exchange – money – upfront in a project is one way to ensure that you keep the attention of all the project participants. In my experience doing stuff for free doesn’t really convince anyone that they need to take what you are doing very seriously – though on the other hand you do need to be sure that the value exchange is fair and defensible. I don’t want to public sector wasting money and I don’t want to be part of helping it waste money. This point of view has taken me a while to come to which is perhaps another story. Its possible that the only way that we will substantively shift government practice is with these kinds of co-created projects and relationships. If this is the case then we need to learn how to work together – systemically – and the kind of cultural exchange that we are starting with Carl could form a valuable part of this learning. As we are both avid bloggers I am imagining you will hear more about this whether you want to or not. There is a lot of challenge in the idea of opening up your organisation to have a client working with you as part of the team – not just on one specific project where they can be contained. Any organisation will have a degree of paddling below the water going on and it takes confidence in what you do to open this up to scrutiny. One of the reasons we are doing this, apart from the fact that you can’t learn without risk, is because we think that any business that works closely with the public sector needs to be setting itself at least the standard of openness that we demand of our government organisations. Projects like Chris Taggert’s Open Corporate is part of this but I think the blurring of organisational boundaries to create the most effective project teams is another. We have all worked closely with other organisations but this blurring of boundaries is something else. I also think these qualities of confidence and openness are essential in a networked organisation but I will come back to that thought another time. The second reason I have been mulling organisational culture was as a result of a twitter conversation discussing whether or not context is significant in terms of defining and understanding innovation. The consensus was a strongly felt ‘yes’ – you can’t describe something as innovative without understanding the context in which the work is done and projects which are innovative in one context may be fairly mundane in others. @Pubstrat has excellent things to say on this subject. This got me thinking about how you might more actively set the context for a future project. We are I hope – subject to various practicalities – about to kick off another Citizenscape pilot in the fairly near future. How can we set the right context for this project? The first and obvious point will be creating the right project team and relationships but I think the critical element of this is in creating a shared context between ourselves and the client. Creating this initial shared understanding and actively discussing the fact that project which is focused on ‘doing things differently’ means that the project itself needs to…well….do things differently. I am trying to put together a more organised set of thoughts around the question of ‘agile project management‘ which I keep coming back to. I think this idea of setting the new, shared, context for a project – or an organisation – is part of that but I also think its part of what it means to participate in a ‘networked’ project which takes place across organisational boundaries. It is more and more frequently the case that we are working in loose coalitions or temporary teams and partnerships and that our different work contexts are colliding. This is happening across internal and external organisational. I think we probably need to be thinking about what this means and trying to capture some of the approaches that make it all work more smoothly – capturing the context is one part of this. The final reason I am thinking about organisational culture is because I find that so many of the conversations that I have with clients that start of talking about social media, engagement and democracy end up really being about organisational change. I increasingly come to the conclusion that we – practitioners – can’t continue to make incremental progress to unlock the real potential of the social web if we don’t start to actively discuss the way in which our organisations will change as a result. This is not saying anything new – we all know this to be true – but how many people are just below the parapet in terms of really talking about this fact within their organisations? How many senior teams are thinking in these terms? Time for a more public discussion and a lot more mulling I think. As regular readers will be aware….I have a bee in my bonnet about the need for someone to start building civic spaces online – spaces which are designed to support civic and political discourse rather than designed to sell us stuff. However it’s all very well having the idea – you then have to figure out how to build it. This post provides an overview of the social media audit – a piece of research that is carried out before you set up a civic space in order to gain an objective view of who you should be including in the conversation. I use ‘we’ a lot in this post as though I had the bright idea of doing the audit and put some structure in place its my team at Public-i who have done most of the detailed development of the process. We’ll be blogging more about this over at the Public-i blog but here is the first draft of the overview that will end up in the thesis. In essence what we are trying to do is to find the conversations which are already taking place in the local online space. More importantly we are trying to find the active individuals in order to create a network response to civic interactions – civic spaces are going to be defined by the networks that share them as much as by the content. When I started looking at this I thought about this idea in terms of government building these spaces. I was influenced by Stephen Coleman’s thinking around ‘A Civic Commons in Cyberspace’ and also Castells’ work that shows the insidious power of media conglomerates and negative impact that gas on objectivity in the press that this brings to the fourth estate (Castells, “Communication Power”). This, combined with the fact that I have been immersed in working with Local Government for almost the last 10 years led me design the “Virtual Town Hall” pilot which you can read about here. The name really gives it away – I was imagining a civic space built by government – echoing real world civic architecture – and then used by the public. I persisted with this idea for a while and blamed the fact that we were being slow to implement the technology for the fact that the pilot sites were not taking flight. There is no doubt that we were being slow with the technology implementation but I now believe that the reasons for the pilot sites not getting off the ground were more complex than just that and that there were a number of issues with the way I had originally designed the virtual town hall solution, the main one being that the original project design didn’t have the right role for the community. We envisaged using unmoderated community content and then using community moderators or champions to widen involvement but this was really a compromise en route to what has become the inclusion of the affordance of co-production in the final pilot sites. We have to accept that we can only work effectively with the public online if we don’t try and control the conversation that the community moderators were in some way an attempt to manage risk from the point of view of the Council without truly considering their wishes in this. However once it became clear that these spaces, even if facilitated by government, needed to be equally owned by all stakeholders another issue arose; who do we include in the conversation? The community that you contact to create the civic space is going to integral to how it behaves and even though we would expect participation to shift throughout the life of a civic space that initial group is significant in terms of how likely you are to get an independent conversation started and also in terms of what tone is set for the space from the outset. Its turns out that picking this group was causing project paralysis – no-one could get started until they knew who to include in the process. I’m going to do some follow up interviews on this point but I think that the issue here was a mix of risk and representativeness. The first was a concern about making the ‘wrong’ choice because we weren’t aware of the full picture. The second is more complex – but I think highlights the real democratic tension here which is the fact that the people who are active online are not representative of the general population and this is both a good and a bad thing. Good in that they are more likely to be civic and active offline as well (OXIS, Coleman) but bad in that they are not well…representative. The solution here is fiendishly simple and fiendishly difficult – involve the elected representatives – but that’s for another post. The starting point as the fact that a civic space can’t be initiated until you have some idea as to who might be participating. The social media audit is a response to this problem – its a systematic piece of research that provides a representative snapshot of the local informal civic conversation so that you can make am informed decision about who to include in the initial iteration of the civic space. Not only that – practically speaking – it gives you the list of people to contact , the conversational lures they are interested and a view of the interactions which are already going on. We wanted to create an objective view of what was happening so that we provided a starting point for engagement with the local civic content creators. We can’t expect to find everything – and the content will change from week to week – but we were looking for a way to provide a starting point that would then be built on rather than freezing the results in time. Its important that the output of the audit also provides the means to extend and continue to search so that the civic space is created in a state of always being open to new voices. Objective is a difficult thing to achieve as ultimately this process comes down to making value judgements about which sites should be included in the civic space. What we have therefore done is to create as robust and re-creatable process around the creation of the data set and then been as transparent as possible in terms of qualification of that data set down to something which is manageable for analysis and then for engagement with individuals. This has deliberately been designed in this way rather than a piece of more quantitative analysis around the number of sites located in a specific area for example as we are trying to uncover individuals with specific intents rather than just to content that they are creating online – we are trying to connect to people as well as places. The audit is designed to find not only an overview of the informal civic participation in the area but specifically to focus in on the significant content creators who will be the most vocal contributors to the civic space. The choice of the word ‘significant’ is deliberate here – we’re not trying to judge influence – just activity. This last one is the most difficult – judging intent from content is extremely tenuous. Another way of looking at this is to say that we looking for content and creators who would satisfy a simple code of conduct test for any community website. Codes of conduct exist to ensure that interactions are respectful and do not insult some basic principles. The point of this filter is to try and rule some of these people out from the start. I see this as largely a pragmatic decision – no council is going to put together a civic space which includes inappropriate content from the start – but its one that needs to be kept under consideration to make sure that the space remains inclusive and open. Its also worth noting that we usually issue a health warning with respect to language – the language online can be robust but this needs to be included. This issue of language is a cultural one where you need to understand that the social web can use a different tone to that which the more formal world is used to. Define a matrix of search terms: This point about language is relevant from the onset of the audit. The process starts with a definition of search terms based on place and topic. We are trying to identify the language that the local residents are using to talk about where they live and about current affairs. We are seeking the stories that are currently active as these are the ones which illuminate activity. Create a data set: we then use a combination of advanced use of google and link analysis to create an initial data set. This can be done largely automatically and then gets deduped and cleaned up. This second step may create a data set of over 1000 sites. Qualify the data set: Once we have the data set narrowed down to around 3-400 then there is a manual qualification task which is the really time-consuming bit as we check each site against the significance criteria and also categorise it for place, topic, type of site and a few other metrics. We also highlight interesting examples – and also the downright odd stuff that you find online. At this point we would hope to have a well qualified data set of around 200 sites that give us a good overview of the local informal civic activity. We do not know if these numbers of going to provide a useful benchmark – we’ve run the process a number of times now and they seem consistent but we expect them to keep increasing. However – at the moment – we believe that the 200 sites for a County or urban area is a reasonable benchmark to work against. Once we have a coded up spreadsheet then we can do some straightforward statistical analysis and look at the spread of sites and content creators in terms of location and topic. We can see what proportion of activity is on Facebook for example (yes – we even search there), examine interactions on local media sites and see if there are pockets of activity around a specific place. We then use this to identity clusters of sites for a short case study analysis – which is really focused on looking at what is causing the cluster and how it might be used to introduce the group into the civic space. The other piece of analysis is to use twitter as the starting point of a social network analysis of the space. This is really just a starting point for this and can be considered to be a snowball approach to an open network (Wasserman) rather than a real piece of SNA but what is does show is the potential reach of the civic creators. For my own research purposes I then ask the civic creators we have found to complete a more through social network analysis questionnaire which looks more deeply not just at their online but also their offline networks. In developing the audit process we considered using semantic analysis tools bit in the end concluded that they didn’t offer the sophistication of search combinations that we were after and, more importantly, are designed to find content rather than individuals. I think we could probably use more of the mainstream analysis tools but to date have not found anything that delivers what we are after – we’ll keep researching this however I will post findings on that when I have time. It may be possible to have the same result through word of mouth as opposed to this fairly labour intensive research – ie by asking community participants to self report activity. My concern with this approach is that many of the sites that we find are not really describing themselves as civic – they are just people who are doing something that they think is interesting and they don’t feel the need to define it. Its too early to say what the overall impact will be on the civic space but we have definitely succeeded in overcoming the project paralysis issue and have also been able to shape appropriate approaches and messages in order to involve these content creators in the initial proposition of the shared civic space and I wouldn’t want to try and instigate a site without doing this kind of research as we have not yet failed to turn up content and individuals that the host was not aware of before. Even without knowing what impact it will have on the civic space its clearly a really effective way of getting a feel for the local activity in order to shape any kind of intervention online. Its also an excellent way to deal with the people who are still saying that they don’t need to engage online – this is as robust a process as we can make it and is carried out based on search terms that the host defines – excellent and relevant local facts to put in front of anyone who thinks digital engagement is still optional at this point. We are going to continue to work on the process and also on the automation of the process where possible. We are also trying to build in the idea of ‘discovery’ where we start to set the civic space in listening mode in order to uncover new civic voices but this is still early days – I’ll keep you posted. As ever comments on this are very welcome.